Agriculture flourishes in the city’s vacant lots—but can it survive the push toward revitalization? DETROIT, Mich.—On a sunny summer afternoon, an ice cream truck sits parked near Woodrow Wilson and West Euclid Street in Detroit, in front of two boarded-up homes with sagging porches and shin-high grass. The doors bear signs warning that the homes are facing foreclosure and imminent transfer to the Detroit Land Bank. The truck’s jingle rings down the block, clanging along with wind chimes. Nearby, a man maneuvers a riding lawnmower in circles around a vacant lot; another batters nails down into his front steps, blanketed with astroturf. Alyssa Trimmer adjusts a sprinkler hooked up to the side of her house. It douses rows of collards and tomatoes in raised beds. The homes that once stood on each side were dismantled long before Trimmer and her partner, Matt Steiner, arrived here from Pittsburgh four years ago. The house that they purchased for $15,000 in 2012—now a farm and hostel dubbed the Detroit Homestead—is bordered by four vacant lots. One came bundled with the home. Another was tax distressed going back a decade, and the owner lived in Amsterdam. Once the city foreclosed on it, Trimmer acquired it at auction for just over $1,000. Had she waited until the property reverted to the Detroit Land Bank, the public authority tasked with amalgamating and shedding blighted or vacant lots, Trimmer might have paid less. It was a gamble, but Trimmer decided to opt for the security of ownership, whatever the cost. “It was at the end of the summer, so we were able to scrape together what we needed,” she says. In Pittsburgh, there was less space for roots to take hold. In her last apartment, Trimmer “didn’t even have a fire escape,” she says. Indoors, she built a hydroponic herb garden for basil and tarragon. But having grown up as a 4-H kid, rambling with rabbits and pigs, she craved more. Trimmer worked as an archaeologist, and Steiner assembled a constellation of odd jobs—bicycle mechanic, rickshaw driver. “So much of our existence in Pittsburgh was working our asses off just to scrape by,” Trimmer says. As he weeds the beds, Steiner tells me he moved nearly 20 times over the course of a decade in Pittsburgh, trying to outrun creeping rents. They “couldn’t afford not to move to Detroit,” Trimmer says, where the cost of living is lower. Urban farmers such as Trimmer are a growing force in Detroit. An estimated 1,400 of them cultivate around 400,000 pounds of fresh produce in the metro area each year. Detroit has no shortage of land, but accessing it can prove difficult for many farmers who worry that the tide of development is sweeping by without them. The Detroit Land Bank holds 95,387 parcels of property that are up for sale. Yet dozens of farmers describe years of agitating for land ownership without success. As the city sets about the business of doling out resources and revitalizing blighted neighborhoods, the question is: why is it taking so long for urban farmers to access land? And can the mosaics of community gardens and farms flourish amid larger-scale development projects? Trimmer says she often calls the Land Bank to check on the status of the lots next door and reiterate her interest. She also goes to block meetings to get face time with city officials. “That should be enough—I mean, hopefully,” she says. “It’s not a guarantee. There’s always a chance it could not go well.” Trimmer worries that someone else could swoop in and scoop up the land she’s been farming, and that she’d have little legal recourse if they did. One barrier to access, farmers say, is a lack of transparency about the land acquisition process. In 2012, the Detroit Food Policy Council, an inter-agency advisory committee, convened a listening session at a local food bank. More than 200 residents turned out, many seeking clarity about public land sales. Drawing upon written and public comments, the council prepared a report recommending that the city make the process more transparent, facilitate a mix of projects—large, small, community, and corporate—and give priority to purchasers looking to secure land in the neighborhood in which they reside. Two years ago, Brittany Bradd, an activist in Detroit’s Brightmoor neighborhood, bought an acre of land that she planned to farm. Ever since, she’s been trying to buy an additional property that remains in limbo. “Some lots are just paperwork in boxes,” she says. Another farmer told me that he plans to visit the Land Bank in person—he wants to leave with a receipt in hand. While some farmers attribute the delays to bureaucratic mishaps, others view them as evidence that the city is privileging some types of land use—and owners—over others. High-profile sales of large tracts of land have proved controversial—particularly the Hantz Woodlands project, which saw 2,000 parcels sold to a financier in 2012 for $0.08 per square foot. The Hantz project was narrowly approved by the city council, which must bless any purchase that exceeds 10 parcels. But the sale galvanized activists who felt the developer got away with a land grab. As the city continues to seek large development projects, some residents worry that it’s opening itself up to speculators and absentee landlords. “You have one set of rules for developers, where they pretty much do what they want,” says Greg Willerer, who runs a farm in the North Corktown neighborhood. One garden in the Cass Corridor district was dismantled in 2011, after a neighboring business purchased the city-owned land the growers had claimed. Some perennials were dug up and carried away; the site was slated to become a fenced-in parking lot. By expanding, the business—a doggy day-care facility—would generate additional payroll taxes for the city. "It would be irresponsible for us to turn down revenue," the Detroit City Council member Saunteel Jenkins, chair of the planning committee, told Crain’s Detroit Business at the time. "The reality is this city cannot rebound unless we find a way to generate taxes, and small businesses are what helps the city thrive." 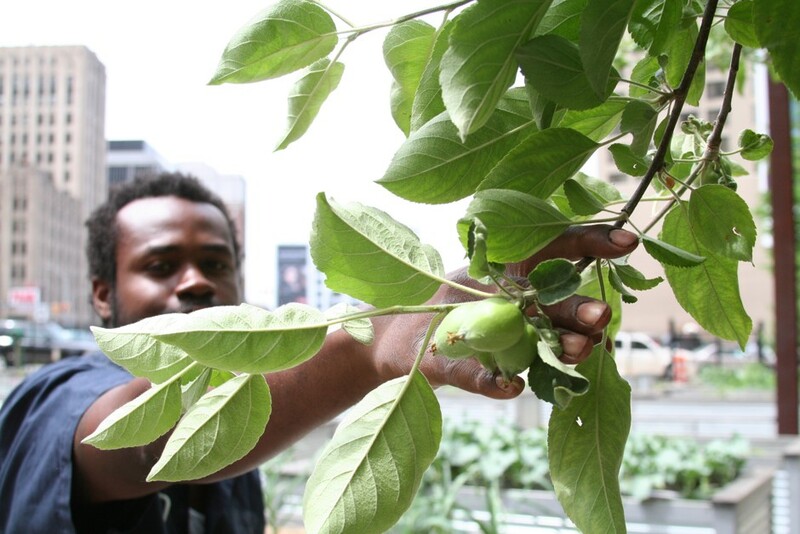 Today, city officials describe a less antagonistic relationship with Detroit’s urban farmers. “We acknowledge that land security is a need, as much for the community gardens as the folks who are earning a living off of urban agriculture,” says Erin Kelly, the lead landscape architect at the city’s planning and development office. Kelly says that, for farmers, start-up costs are irrevocably sunk into the land itself; moving to a new location can be extremely complicated. Meanwhile, the Land Bank is unloading some parcels via the Side Lot program, through which homeowners who are up-to-date on their property taxes can purchase land immediately adjacent to their houses. When a property is demolished, Fahle says, the Land Bank mails a postcard to neighbors, who can then request a deed. “Anybody who is eligible to buy a side lot, we want them to get it,” Fahle says. As of July, Detroit has demolished more than 10,000 homes under the banner of blight removal, and the Land Bank has held numerous Side Lot fairs across the city—pop-up field offices with laptops and printers where prospective buyers check in with the county treasurer and leave with a deed. “One guy was trying to buy his lot for four years from the city; it took us 40 minutes,” Fahle says. Those lots go for $100. By the end of the summer, Fahle expects to have sold 5,000. Activists and officials agree that existing agriculture doesn’t necessarily jeopardize long-term planning. Still, some advocate dramatic change. They’re angling for tangible policies that reprioritize fresh produce and recast the role that farming can play in a modern American city. Increasingly, though, Detroit is experimenting with the idea that urban areas can look more stereotypically rural. There have been moments of accord between farmers and the city. The Detroit Future City plan, an elephantine urban planning framework put forward in 2012, proposed that some land be reserved for farming, green infrastructure, and environmental remediation. An agriculture ordinance passed in 2013 enacted some protections for urban farmers, and enabled growers to hold curbside markets near their farms. Organizations such as the Detroit Food Policy Council have been instrumental in connecting farmers with officials. “Our voices were heard, and [the city] came to understand that urban agriculture was not a thing that attracted rats, it wasn’t a mess, people weren’t dumping tires here—they were actually farming,” says Myrtle Curtis, who runs Feedom Freedom farm. Permits to tap into fire hydrants for irrigation purposes, she says, are the result of years of conversations between farmers and city agencies. An in-progress livestock ordinance—which proponents deemed to be too divisive to bundle with the agriculture legislation back in 2013—could protect farmers who keep chickens or goats against citations and confiscations, while also establishing regulations to curb any offensive smells or noises. Still, some farmers and advocates feel that the city’s not going far enough to help them. Many hope to secure water at a reduced agricultural rate, instead of paying the rate billed to residences. Others worry they’ll lose hard-won access to their land if it falls near the footprint of larger projects, for which developers may have negotiated first right of refusal. To bridge the gap, farmers are actively looking for foundation grants and citizen-supported funding. Ryan Anderson, a co-founder of ACRE farm in the North Corktown district, is launching a campaign on Public Equity Detroit—a crowdfunding site similar to Kickstarter—to finance water access. ACRE isn’t connected to the water grid. In previous seasons, Anderson says, his crops have flourished with rainwater; this year, a drought has left them parched. “It could cost as much as $10,000 to have a hydrant put in with a meter on it,” Anderson says. ACRE is also currently a finalist for a grant from the New Ideas Initiative (NEI), backed by the Community Foundation for Southeast Michigan. That funding would go towards installing a hoop house, he says—a plastic-covered tunnel of bowed pipes that insulates crops and extends the growing season. Kelly, the landscape architect, sees the potential for farms to help Detroit come into compliance with the storm water management mandates set forth in the Clean Water Act. Green landscapes, she says, could siphon storm water, slowing runoff to receiving waters and tamping down on the impact of combined sewer overflows—a relief for the city’s aging and overtaxed system. Farms and gardens, she adds, could also “create pathways to employment, local wealth creation, and deliver maintenance to our neighborhoods and to the city.” Living landscapes—in the form of tree stands, parks, and robust urban agriculture—“could be a source of permanent water management moving forward,” she says. This summer, the city has been soliciting proposals for a living laboratory to explore what Cox calls “a new typology of neighborhoods,” in which green spaces are deliberately and profoundly integrated into the community. The Fitzgerald Revitalization Project, partially backed by grants from the Kresge Foundation and the Michigan Economic Development Corporation, will turn a quarter-square-mile into a proving ground for green projects such as farms. Winning proposals will be selected in September and awarded a 30-year lease for all or part of an available 257 lots. Since the conditions—moderate vacancy, a large percentage of disused properties—are mirrored in other neighborhoods, “we hope that we will be able to replicate this model in different sections of the city,” Cox says. Trimmer hopes to grow most of her own food, with enough surplus to leave some on neighbors’ porches. To keep the plants safe from prowling cats and hungry pheasants, she made a scarecrow out of wooden planks and a spray-painted popcorn tin. She stuffed him with plastic bags and dressed him in thrift-store clothes. The birds weren’t deterred—they decimated her huckleberry. As she prepares to head out for a community meeting, Trimmer decides to leave the sprinkler on, spraying droplets in an arc across the dirt. Thoroughly soaking the plants gives them the best shot at making it through the long, hot Michigan summer. “I just want to make the most of the land,” she says. This is the second piece in a three-part series about urban agriculture in Detroit. The first installment examined farming as a tool for self-sufficiency; the third looks at how the harvest can help the city’s food system.